A quick note on obelisks, as I see the one in the background of the painting is described as an ‘unlikely architectural feature’. I don’t think this is quite right. Obelisks were, in fact, rather common in northern architecture of the period, featuring regularly in formal gardens. 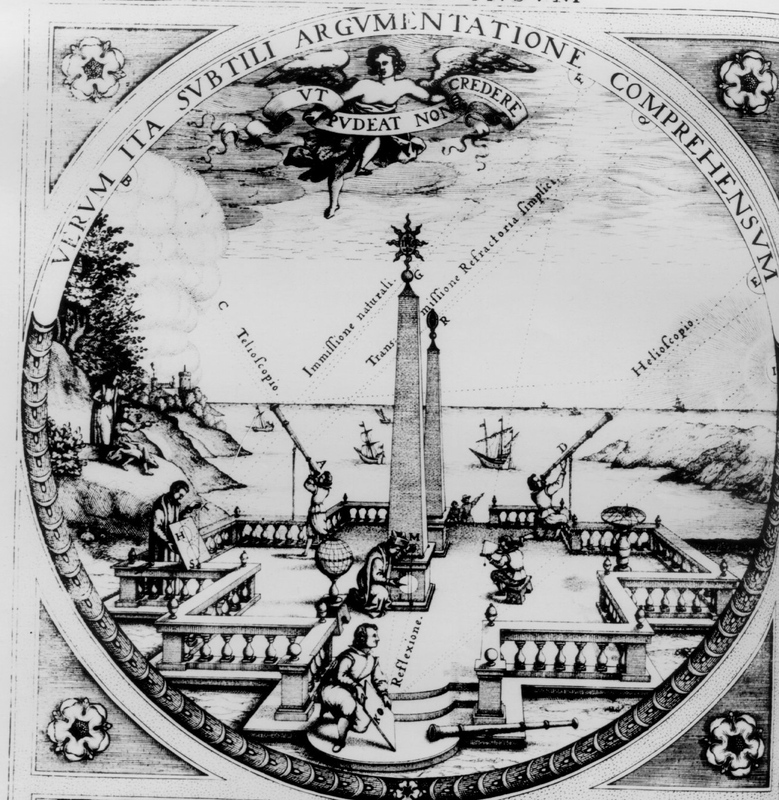 For example, Robert Dudley’s garden at Kenilworth(visited by Elizabeth I in 1575) was divided into four quarters, each of which had an obelisk in the centre, “rising pyramidically fifteen feet high” with an orb “of porphyry” on the top. So, we shouldn’t be surprised that the garden in the background of the Linder gallery contains such a feature. It may have been modeled on one of Hans Vredeman de Vries’s popular and widely circulated designs, an example of which is shown below. 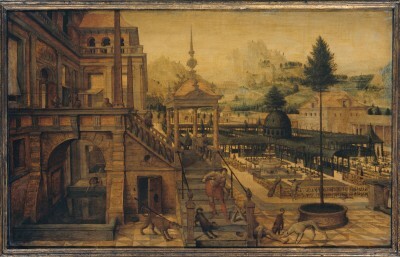 We can also see, in this painting by Vredeman de Vries, a configuration of balcony, staircase, and obelisk more or less identical to the configuration of the Linder gallery . Yes – I’ve added a post showing more or less exactly what we see in the Linder gallery. Nice! Is this real or imaginary architecture do we know? Imaginary – pretty much all of Vredeman de Vries’s designs were, but they both reflected and served as the basis for realized architecture. To me, the garden in the Linder gallery is highly reminiscent of de Vries’s designs. Possibly coincidental, but the tall tree towards the rear of the garden is a dead ringer for the one in the Vredeman de Vries painting shown in this post. My point is that Vredeman de Vries was so popular, so widely known, that he’s a very likely source of inspiration for the artist of the Linder painting. Moreover, there’s no reason to suppose that the architecture and garden of the Linder gallery are intended to be ‘real’. Far more likely they are fictive – that is certainly the convention of every example of the genre ‘pictures of collections’ that I know of. Great! So after all it looks like we are agreed then that this is imaginary architecture rather than a depiction of a real architectural feature. And if imaginary, we have to ask why? 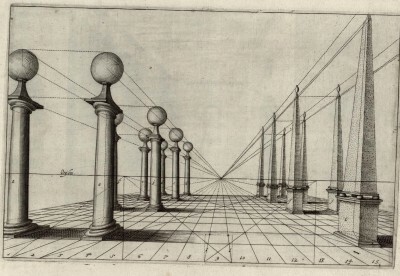 And to me the why may well be connected as much to the astronomical significance of obelisks in the 1620s as to the architectural fantasies of Vredeman de Vries. I have a painting that is signed and # on the rear, right side of the canvas. The signature is hard to make out. My guess would be lwder by the way it is written. It is large in size and uses gold, blue and green colors mostly. There is a brown and gray and white bird with red over it’s head which is the focal point if the painting. Does anyone have any ideas who the artist is? Thank you so much.